The Trumpeter Swan is North America's largest bird and one of its rarest. It embodies grace, beauty, and unspoiled wildness. It is the crown jewel of healthy wetlands. Trumpeter Swans need your help to continue their comeback. Join our efforts. Get involved. Help bring back North America's wild and beautiful Trumpeter Swan. The Trumpeter Swan is an "indicator species" of healthy wetlands and waterways. They thrive in clean waters and high quality habitats supporting countless plant and animal species. Trumpeter Swans are symbols of hope showing that science, partnerships, and perseverance can bring a species back from the brink of extinction. 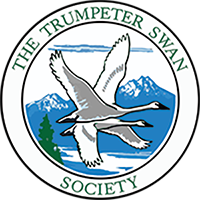 The Trumpeter Swan Society (TTSS) is a non-profit organization, founded in 1968. Our mission is to assure the vitality and welfare of wild Trumpeter Swans. We invite you to join this vital and important mission. Early settlers nearly destroyed this magnificent species by the late 1800s. However, over the past few decades, people have passionately and with immense dedication worked to put Trumpeters on the journey to recovery. You can too. Your support ensures Trumpeter Swans will not disappear in our modern world. Our donors make it possible for The Trumpeter Swan Society to provide the vision, knowledge, and advocacy to move restoration efforts forward and improve management of Trumpeter Swans across North America. TTSS has been involved in every major restoration effort on the continent. We work with partners across North America on swan restoration and management issues. We are your voice for Trumpeter Swans in each Flyway in North America. Through your support we will continue to address threats to their welfare and vitality; threats to secure nesting and wintering habitats; threats to health such as powerline collisions and lead poisoning. Since 1969, TTSS has held biennial Swan Conferences to gather and share the most current scientific swan research. The conferences build and strengthen a strong and effective "swan network" across North America, working to make Trumpeter Swans populations secure. Past conference research papers are published in our periodic scientific Bulletin, North American Swans. The success of our swan programs come from donors like you who give vital support to the work of our staff and Board of Directors. The Society's administrative office is at Three Rivers Park District, Plymouth, Minnesota, where TTSS began. Donors receive our member newsletter, Trumpetings sharing the impact you are making for swan conservation. We would be honored if you would join us on this remarkable journey of hope, inspiration, and recovery of a North American species. We are a registered nonprofit Section 501(c)(3) organization under the U.S. Internal Revenue Code. Contributions are tax deductible in the United States to the extent allowed by law.